Grandchildren are a delight to grandparents, and grandma and grandpa in turn add much to their grandkids' lives. 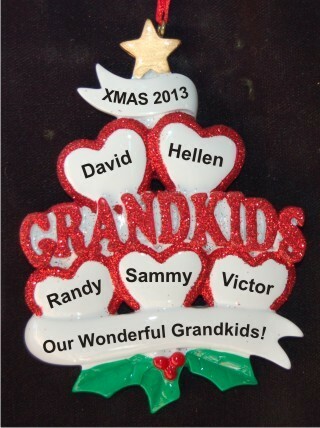 Celebrate the bond between the generations this year with the 5 grandkids - loving hearts at Christmas personalized Christmas ornament from Russell Rhodes. It exudes the joy of the season with a bright Christmas star at the top, glittering letters and hearts and a festive sprig of holiday holly to complete the package. We'll help you create a true family heirloom by adding the information you provide. 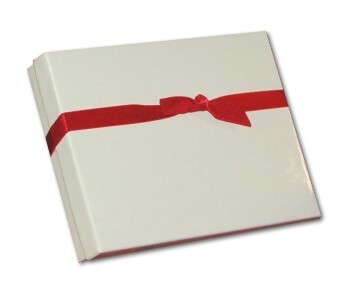 The names and your custom sentiments will be lettered on by hand where shown, though the font will be a stylish one. Rejoice together this season with the stacked hearts 5 grandkids personalized Christmas ornament in our classic velvet drawstring bag.